I would love some advice on how to label and what to tab for the CPCO. I found it to be a difficult test and most information not in the study materials provided. I failed my first time, but it is something I would really LOVE to pursue and PASS. I would love any recommended study technique or courses you took. ( I took the AAPC CPCO exam course previous to testing). I found that the ALMOST any published reference materials very vague and confusing. 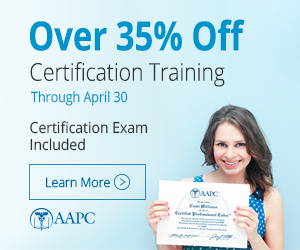 If you have not combed through all of the resources on the test page (https://www.aapc.com/certification/cpco.aspx), that would be a good place to start. That page tells you that x number of questions will be about this topic and provides hyperlinks to all the resources. Prioritize your study focus around this information -- if a certain topic has 40 questions, and another only has one, you know where to invest the most time. My information was organized into three binders. One was for OIG-related information; one was for Medicare-related information; and the other was for miscellaneous laws, statistics, and other information that didn't fit exactly in my other two binders. It is important that you understand the information and don't try to memorize individual facts. It is also important to be able to locate information quickly. I asked my daughter to read me questions from the study guide, and I would try to find the answer in my material in less than 45 seconds (even if I knew the answer). If you can't find something you need, having hundreds of pages in binders does not help you. You can take any printed material in with you, EXCEPT for the AAPC study guide and any material from HCCA. I did not take the course, but I did utilize every resource available to me, including the AAPC study guide and the online practice exam. In January of 2018, I started my own study process, and passed my test in August on my first try. It would probably be a good idea to invest in the 2019 study guide if you plan to retake the exam next year, to make sure you have the most updated information. Last edited by Skymom; 11-14-2018 at 05:25 PM.